The people were helpful and the whole process was efficient and smooth this year, especially when compared to the bitter memory of the last elections. With Naya Pakistan having officially dawned, and Prime Minister Imran Khan having taken oath, I am hopeful that the tabdeeli that was promised to us – the Naya Pakistan we have put our faith in – will also be an inclusive Pakistan. A Pakistan where we are all given the same opportunities; one where our identities are not confined to labels and stereotypes. A Pakistan where we, the differently-abled, will not be seen as ‘disabled’, but as persons with different capabilities. A Pakistan where we are not defined by our wheelchairs, but are instead recognised for the individuals we are striving to become. After all, we may not meet society’s definition of ‘normal’, but that does not make us ‘abnormal’. As a person who was not born into a wheelchair, I have witnessed the stark contrast in my own life before and after my accident. I had just started medical school, when a car accident on the motorway left me paralysed from the neck down. While my friends were attending their Welcome Ceremony, I was fighting for my life! Dealing with a traumatic experience is not easy, and it does not help to be in a society unwelcoming towards or disinterested in facilitating people with special needs. Since I have spent a fair share of my life in hospitals, I know first-hand the trials and struggles that are a part of a ‘disabled’ person’s life. The constant stares and the unfriendly or pitying expressions are enough to discourage a person who is already struggling. The people here continually make you feel like a burden, as though you have no right to exist. Sadly, I have found empathy and kindness to be lacking in our society. After living in Pakistan – a place where the differently abled are mostly marginalised and not counted as a statistic – it really is mind-blowing to witness developed countries prioritising the ‘disabled’, the elderly, along with people with limited mobility. It’s not just in public transport, it’s everywhere. Whenever I travel internationally, wherever I go, I am accommodated and facilitated – a stark contrast to how I am treated here, in my own motherland! For instance, my experiences over the years at the Allama Iqbal Airport alone have left me enraged and sad. Similarly, when I went to vote for the first time in 2013, the attitude of a woman who refused to let me and my carer go and vote first left me feeling as if I did not deserve to be there. This year, however, although I still had to be lifted up the three steps as there was no ramp at my polling station, there was a remarked difference in the attitude. 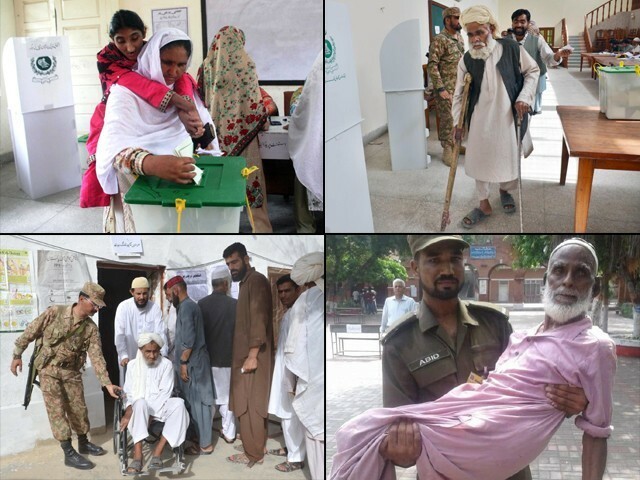 The presiding officers, the army personnel, and even the public were all very helpful and the whole process was very efficient and smooth, especially when compared to the bitter memory of last time. My life changed when I got into my accident. But my life also changed because I was privileged enough to go to England for rehabilitation. It was there that my myopic vision of life changed, as I saw people in worse conditions than me living independent and fulfilling lives. The very purpose of rehabilitation is to make the patient start living a normal life, as much as their condition allows. But how can we return to a life when basic things such as access are denied to us? Access to public and commercial buildings is the first step towards inclusion, and is the gateway for wheelchair users and people with special needs in their pursuit of living a happy, complete and normal life. But how can we start living when we cannot even enter schools, colleges, offices, restaurants, banks, malls, cinemas, and so on in a proper and safe manner? Wheelchair users have been marginalised as a community because of lack of access to basic facilities such as education, healthcare and employment. Sadly, the state has systematically made us feel unwelcomed and invisible for far too long by simply denying us our basic rights. The irony is that the LDA building is itself in violation of its building code, and remains apathetic towards implementing its own regulations within its jurisdiction! Forever the optimist though, I have not given up hope. I am encouraged by the fact that my social media posts have led to a few restaurants making ramps or putting portable ones in place, thus making it possible for wheelchair users to enter without the indignity and risk of being manually lifted. I am hopeful that every commercial building owner will welcome wheelchair users by providing a ramp, a designated parking space and a toilet for the differently-abled in its premises. This will not just impact quadriplegic wheelchair users such as myself, but also persons with limited mobility who use wheelchairs, such as the elderly or those suffering from amputation, arthritis, cerebral palsy, multiple sclerosis, post-polio syndrome, back disorders, and so on. A ramp may not be the solution to all our problems, but it is the first step in making us a part of the fabric of our society. In making us feel like we deserve to be here too. It is the sign of acceptance.